The gilthead bream has a high, compact body. It is usually recognised because it has a yellow band on the front of its head, between the eyes. Its back is silver grey and its flanks are grey with some golden reflections. It also has a dark stain around the opercula. It behaves in a solitary manner and sometimes forms small groups. 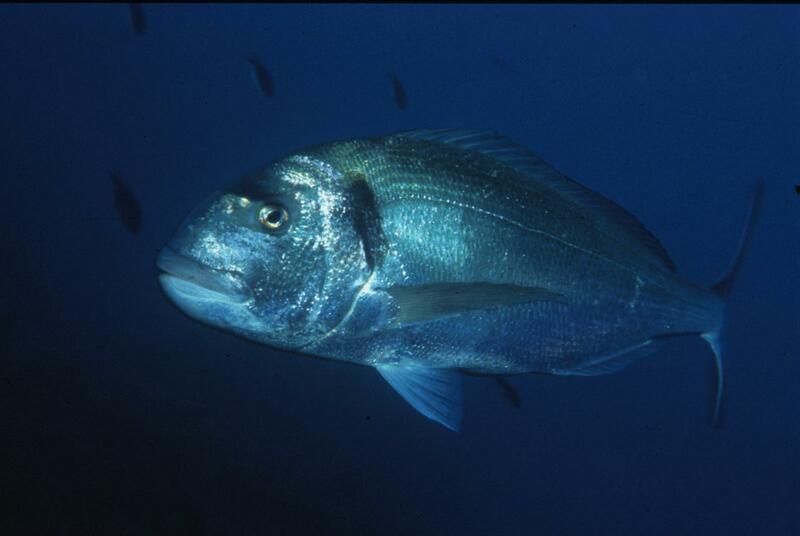 When feeding, the gilthead bream prefers mussels, but it also eats crustaceans and fish and occasionally seaweed. It is an oviparous species. In the first and second year of its life, it is usually male and becomes female later on. In the winter it goes to deeper waters to reproduce. They reproduce from October to December. They have an extraordinary capacity to withstand salinity variations. In spring they gather wherever the water is salty, and in summer remain close to the bank, returning in winter to deeper waters to reproduce. This is a shallow water species that generally goes no deeper than 30 m. It tolerates and even prefers saltier waters. Common on sandy beds and Neptune grass fields. It is in the Mediterranean and the eastern Atlantic from the north of the Bay of Biscay to Ghana. The name gilthead comes from the yellow line it has between the eyes.